Your likes on Facebook say more about you than you would think. 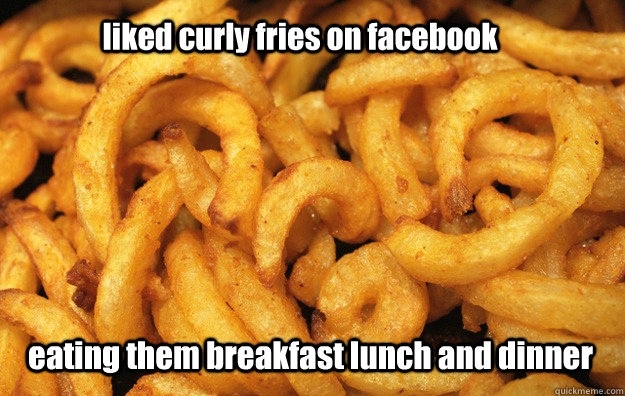 For example: showing affinity for curly fries means you are likely to be a smart one, where being a fan of Harley Davidson means your not. Yes, it’s true, your online tastes can make companies know you better than your own family or friends do, and figure out the stuff that you would rather keep secret, or at least silent. In a Cambridge University research conducted in the US and published this week shows how much of your personal characteristics can be discovered through what you've liked on Facebook, and the results are compelling. The personal portraits that are painted from seemingly random information are creepily accurate, ranging from predictions about traits such as sexual orientation, to age, race and political affiliation. They can even correctly predict if your parents stayed together until your 21st birthday (or not) six out of ten times. That personal traits can be deduced from ones Facebook likes is not a revolutionary idea, but the main merit of this study is that it shows how much of personal information is unintentionally shared by Facebook users. Especially considering the enormous accumulation of random data (also known as Big Data) where our online activity is collected. Advertisers and social media firms are hungry for such data in order to customize advertisements and even search results, which is also not a new development, but the extent of what can be discovered through a simple like according to this research gives reason to pause and consider what we unknowingly share. Protecting your Facebook behaviour is important, as is being aware of the possible invasion of privacy through data accumulated by websites such as Facebook. We often do have a choice over how much is shared by adjusting our privacy settings, or refusing to use an online service because of particular clauses in their service agreement. So please be aware of what you share even with a simple like on facebook, and choose to keep the private private.